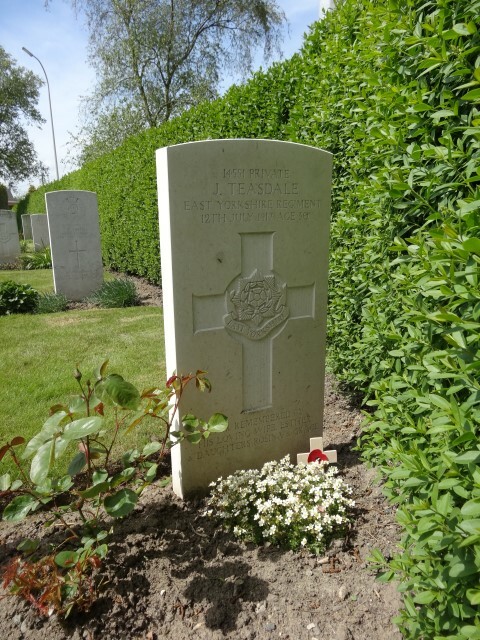 14551 Private John Teasdale 6th Battalion, the East Yorkshire Regiment was killed in action 12 July 1917 and is buried in Brandhoek Military Cemetery, Belgium. He was 30 years old and is commemorated on the West Auckland Memorial and the Roll of Honour, West Auckland Memorial Hall. In 1891 Margaret was 40-year old, single and head of the family. They lived at Foundry Yard, West Auckland. In 1901, the family lived at East View, West Auckland and 50 year old Margaret was described as a “charwoman” and 15 year old John was employed as a “driver in a coal mine”. In 1911, the family were still at East View, 24 year old John worked as a coal miner (putter), 20 year old William as a coal miner (labourer) and 18 year old Robert as a coal miner (labourer). It is recorded that 26 year old Henderson had an accident when 11 year old and could not work. The Army Form records that John’s parents were dead and a John Hogg from New Street, West Auckland had married his mother but she had since died. It was recorded that he had no brothers or sisters but this seems to be incorrect. In 1911, John’s wife Esther and daughter Rosina are recorded as living with her mother Emma Brunskill at High Etherley. As stated above, John lived at East View, West Auckland with his mother and brothers. Later, they may have lived at 24 Salisbury Square, West Auckland. John’s younger brother William was killed in action – 17114 Private William Teasdale 9th Bn., the Yorkshire Regiment was killed in action 19 September 1916 and is commemorated on the Thiepval Memorial. He was 26 years old and is commemorated on the West Auckland War Memorial and the Roll of Honour West Auckland Memorial Hall. In 1918, Esther married Robert Reed  and lived at King Street, Witton Park. John Teasdale attested 2 November 1914 at Bishop Auckland aged 28 years and joined the East Yorkshire Regiment and was given the regimental number 14551. He undertook a medical examination 2 November 1914 and was considered fit for service. He was 5’4½” tall and weighed 138 lbs. He had a sallow complexion, brown eyes and brown hair. His religion was Church of England. 12 November 1914, he was posted to the 9th Battalion then 7 October 1915 he was posted to the 6th Battalion. 1 July 1915, it sailed to Gallipoli and landed at Suvla Bay 7 August 1915. 26 January: the Division began to move to Egypt. 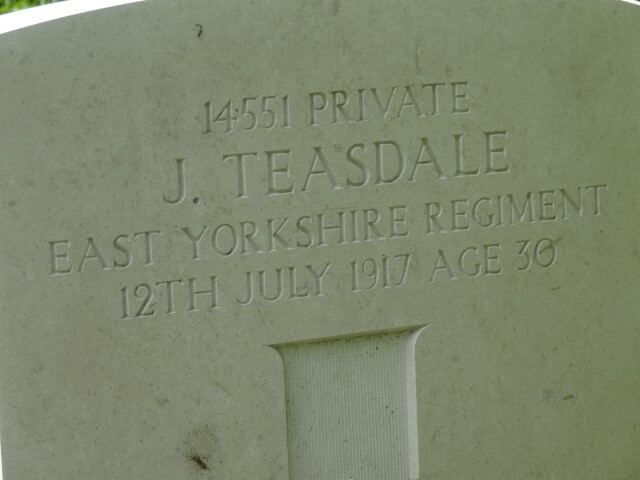 12 July: Private J. Teasdale was killed in action. 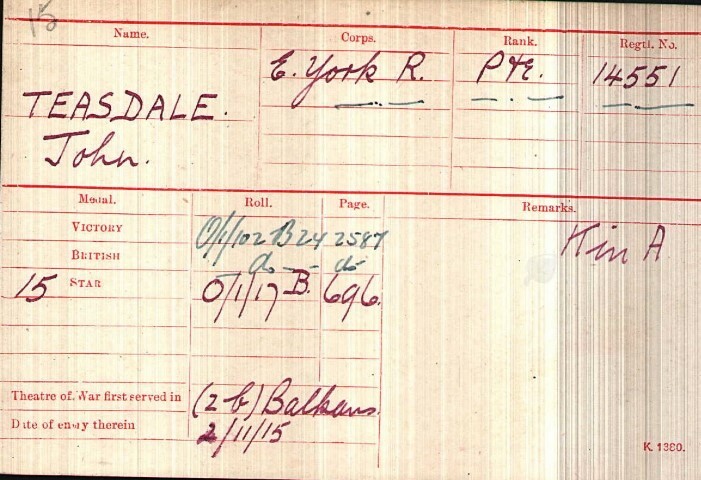 Private J. Teasdale was the only soldier serving with 6/EYR to be killed on that day. The 6/EYR War Diary has not been researched so the circumstances surrounding his death remain unknown. At this time the British forces were gearing up for the next assault on the German Line in Belgian Flanders i.e. the Third Battle of Ypres, more commonly known as Passchendaele. This battle commenced 31 July, preceded by a massive artillery bombardment which started 18 July. His battalion was a Pioneer Battalion for the Division so they would be involved with general duties such as digging trenches, repair work etc. It is possible that he was hit by sniper fire or shrapnel from shelling – the usual violence of warfare, whilst carrying out his duties. Private J. Teasdale was awarded the 1914-15 Star, the British War and Victory medals. Field ambulances were posted in the vicinity and the Military Cemetery was opened in May 1915. 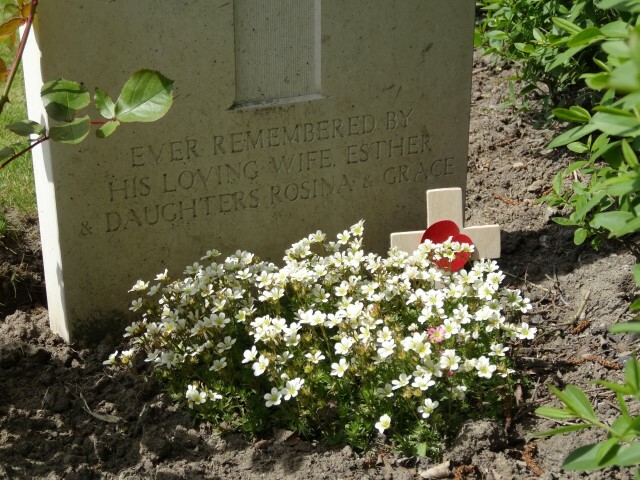 There are 669 First World War burials. Private John Teasdale is commemorated on the West Auckland Memorial and the Roll of Honour, West Auckland Memorial Hall.